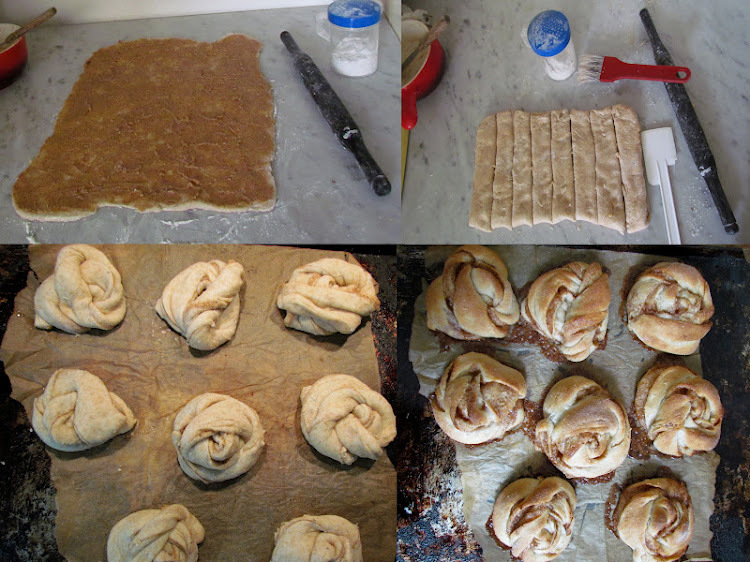 I've talked about cinnamon rolls before, and created a version that was a cross between Swedish and American, but now it's time to talk about the real kanelbulle, (kanel = cinnamon, bulle = bun; kanelbulle = one bun; kanelbullar = many buns) that's popular all over Sweden. I'm basing mine on the one found at Fabrique bakery, which I think is the best in Stockholm. Firstly, it's scented heavily with cardamom seeds, secondly, it's flakey-bready-soft on the inside and slightly crispy on the outside, and most importantly, it has a distinct toffee flavor. My recipe happily matches these traits and makes it slightly healthier! There are two methods of making my recipe. The first is the usual method of kneading the dough, allowing it to sit for 1 1/2 hours, shaping, and then proofing 30-45 minutes before baking. The other option, and my favorite, is to mix (not knead) the dough right before you sleep, place it in the fridge, bring it to room temperature in the morning, shape, rest and bake. Either way, it's a great sweet bun to prepare for a weekend brunch, when you actually have time to enjoy it. A word about cardamom - I suggest taking the seeds out of their pods and roughly grinding it with a mortar and pestle. You could also grind it in a coffee grinder or crush it with a heavy skillet. Grinding freshly guarantees a vivid cardamom flavor that Swedes love in their baked goods. 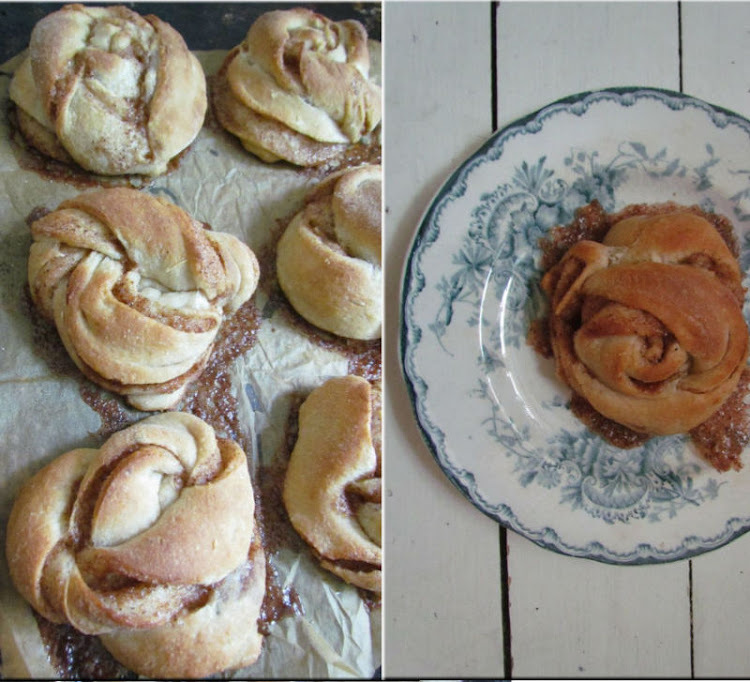 We actually supplied my husband's sister's recipe for kanelbullar to guests at our wedding because cardamom is an Indian ingredient and we think it's a beautiful marriage in these Swedish buns. You'll be ecstatic to know that I've made this recipe healthier. Yes I have! Since I make these obsessively, (and have since started jogging 3 times a week in order to continue to enjoy them), I've replaced some of the butter with oil and used a little bit of whole spelt flour. These changes don't affect the beautiful softness of the buns, so why not try it out and let me know what you think! I'm also submitting this recipe to Yeastspotting! 1. Heat milk and water in a microwave-safe bowl until warm. Add sugar and yeast and allow to proof: you should see bubbles or froth after a few minutes, then you know your yeast is active. 2. Add flours, salt, cardamom and oil to the yeast mixture and mix. Cover and place in the fridge for 8 - 10 hours. In the morning, bring to room temperature before rolling and applying the filling. 3. For a quicker method: Knead the dough, which should be on the soft, stickier side (if too smooth, then more water is needed) until elastic (to test, poke a finger into the dough -- it should spring back if it's kneaded enough.) Cover with a tea towel and keep in a warm place for 1 1/2 - 2 hours. 4. Mix the filling ingredients in a separate bowl. Once the dough has proofed or come to room temperature, roll into a rectangle to an 1/8 inch thickness. Spread the filling evenly over the dough. Fold the dough into half. Cut the dough into 8 strips. 5. Take each strip and stretch it until almost doubled in length. Then wrap twice around 2 of your fingers, then take the remaining strip and wrap over the top and end it under the bun. Here is a video for a visual example. 6. Arrange on a parchment-lined baking sheet, allowing enough space, about 2 inches, between all of them. Place a tea towel over them and proof for 30 - 40 minutes. 7. Preheat the oven to 200C or 400F. Bake for 10 - 12 minutes, until golden. Enjoy after about 5 minutes of rest! Store the remaining buns in an airtight container. Notes: You can of course skip the whole grain and go full out with the all-purpose flour. These are best the day they're baked, but if eating the day after, are redeemed after 10-12 seconds in the microwave. Hi Eileen! Thanks so much! I know, sometimes the American ones were just too much, but I miss them in their own right. These Swedish ones are really not too sweet, in fact, I changed the recipe from 1/3 cup sugar to 1/2 cup to help it a little. I hope you make them! Thanks Korena, I do hope to hear from you after you've tried the recipe! Yey! I am so glad the recipe worked out for you, Korena!